Description: Neither of these concertos is available on disc, so we've imported this 2006 release direct from Germany. The piano concerto dates from 1805-06 and makes plain Wilms' avowed model: you could call it the Mozart Piano Concerto No. 28. 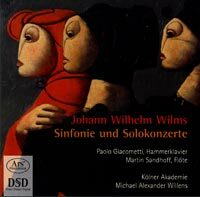 Wilms starts in heroic mode but then wittily lets that mood evaporate and settles into an attractive alternation of lyrical grace and glittering virtuosity. The flute concerto dates from 1811 and is notable for its fairly light and pleasant manner (no florid virtuosity) and its polonaise finale. The early (mid 1790s) symphony is modeled on Mozart's No. 39 and on Haydn's late symphonies in general but shows the young Wilms confidently working within tradition and not copying it. Paolo Giacometti (fortepiano), Martin Sandhoff (flute), Kölner Akademie; Michael Alexander Willens.